Sometimes good ideas don’t come together into being good final products. What sounds good on paper can be lackluster in execution. Not so much with Steredenn ($3.99), which sounded amazing on paper! 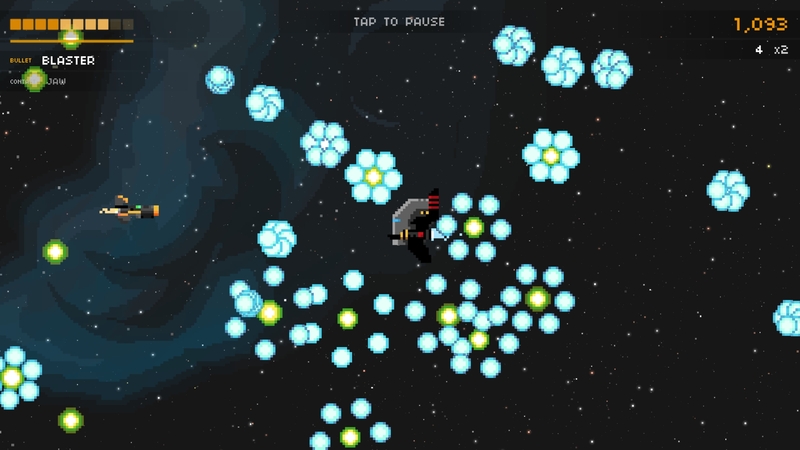 A roguelike combined with a shoot ’em up, with a heavy metal soundtrack? It’s like Pixelnest said “How can we make a game that Carter Dotson would enjoy?" Then, they made it. Of course, they didn’t do exactly that since it didn’t release on mobile for about a year and a half after its original release, and I am kicking myself for having not played it until now. 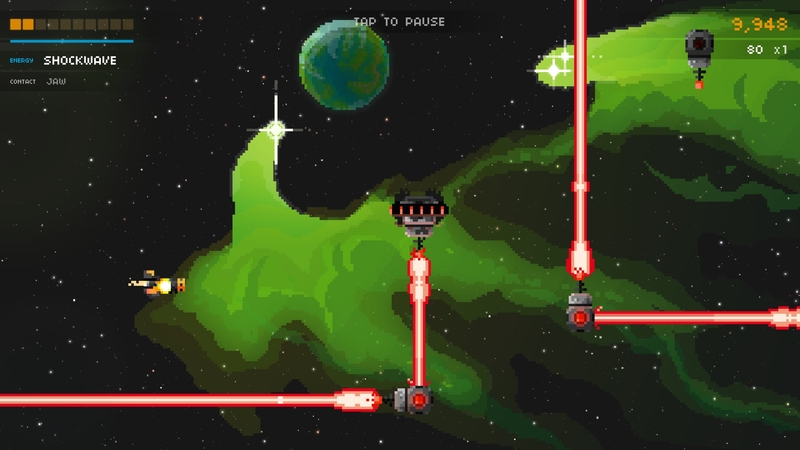 Well, better late than never: Steredenn is fantastic fun for fans of roguelikes, shoot ’em ups, and/or heavy metal. While Steredenn fails the Berlin definition of the roguelike, it does have some strong credentials for those who want a bit of purity from the definition. That is, every game session starts out the same: you have your blaster, you start from level 1, and go from there. Bosses start to become familiar over time, but levels are otherwise generated randomly. When you beat the game, it does loop around, there isn’t necessarily a finite ending, though there is the seeded Superplay mode that you can enjoy if you want more of a fixed challenge. Certainly, the limited number of opportunities to pick up new weapons means that learning how to play with what you get becomes key to success, because unless you can survive a long time, you might not get exactly what you want. This definitely feels like a game where learning how the weapons work, which general types work together (like combining bots with a good weapon for direct attacks), and figuring out general enemy strategies is key to success. That also means a lot of failure along the way. The randomness isn’t particularly extreme, as the game focuses on a core set of enemies, but the items you get each time through are random, and the attacks the bosses use will vary. The health system makes Steredenn quite approachable, though. If you take damage, you know it’s not the end, and you have a limited invincibility recovery period. You also get all your health back after each boss fight. Now, your opinion on this might be mixed. It does mean that each wave serves as a self-contained experience. But if you enjoy Wayward Souls because you have to play smartly on each level with only limited health regeneration, this might not be to your taste. But in a sense, it’s more fair. It makes it so that each challenge is being given on its fair merits, and your struggles on an earlier wave don’t mean that you are handicapped on a future wave. Obviously, if you don’t get weapons or powerups that are ideal to your plan of attack, then it might make things more difficult for you, but that’s just part of the luck of the draw inherent to roguelikes. Part of the fun of Steredenn is that the weapons you get are so unconventional. Why not have a giant set of chompers that you use to, uh, chomp your enemies to bits? Sometimes they’re of limited utility, but that’s fine. Your starting blaster is a simple but capable weapon. Still, other weapons can implement new play styles if you’re so inclined. The buzzsaw lets you take the fight to enemies. The shockwave serves as a defensive weapon, canceling bullets but also hitting enemies in range if you charge it up. Shields have obvious purposes. The boomerang is fun, as you can catch it to get the energy you spend back on it, but also can let it go to hit targets behind you. The weapons will change how you play, but again, you can do quite well with the core blaster. At least you get two weapons to use, and adapting to useful combinations is fun. While Steredenn is at its most ideal with a controller (though there are some issues with MFi controllers on iPads as of launch), the touch controls are absolutely no slouch. You swipe to swap weapons, and double-tap to pick up items, all on the right side of the screen. The left side of the screen moves, and it’s responsive to subtle movements. But what’s most clever is an indicator when you have your ship near your thumb; the vertical and horizontal lines show where your ship is so that you have an idea where you are. It’s a clever addition other shooters need to steal. And in fact, it needs to be added to the right side of the screen, as you can obscure your ship with your other thumb. This happens periodically when fighting bosses, where dodging bullets will take you to the other side of the screen. The style of the game is really cool throughout. The metal music is Carter-approved. The pixel art is detailed, and vibrant with all sorts of colors. I’ve heard this described as the Wayward Souls ($6.99) of shoot ’em ups, and it seems not entirely inappropriate in terms of visuals and tone. There’s also a bit of whimsy to the game. The bosses have occasionally humorous descriptions, and the text after you die cracks a joke occasionally. It’s not overbearing to the potential serious tone of Steredenn, but it’s there to lighten the mood every now and then. After a frustrating death, it’s good to get a nice laugh in. I hope this also serves as a good reminder to developers that if you can fit your game on mobile, it’s probably worth it! A title like this is an amazing fit on the go, and while I missed it early on (and I imagine I’m not alone), it’s getting a great second wind on mobile. 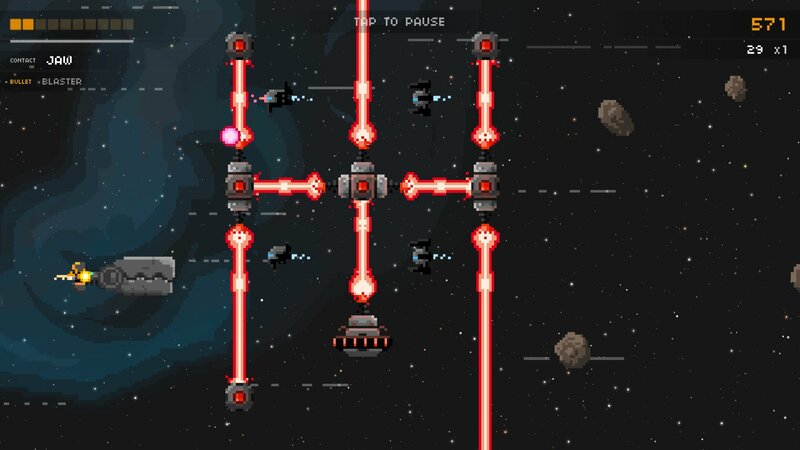 With a great mobile port like this, Steredenn is an absolute must-have for anyone who has any positive feelings toward roguelikes and/or shoot ’em ups. It’s challenging, as you would hope, but such a fun, rewarding, and replayable game.